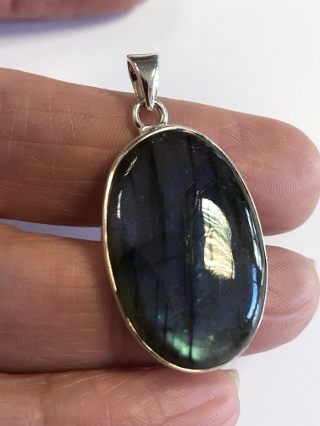 A striking Labradorite pendant, set in 925 silver. Labradorite is a dark feldspar with beautiful, iridescent reflections, glinting blue, green or yellowy-brown flashes at you. A stone of comfort - it is used to dispel fears and negativity, and to bring a rational view point to walk forward with courage.